×X× (pronounced as Triple X) is the soundtrack to the 2002 film of the same name. It was released on August 6, 2002 through Universal Records as a two-disc set, with the first disc, The Heavy Metal Side, containing alternative rock (and a little bit of metal and techno) and the second disc, The Xander Side, containing hip hop. The soundtrack was a success, peaking at 9 on the Billboard 200, 16 on the Top R&B/Hip-Hop Albums and 1 on the Top Soundtracks, and was certified gold by the RIAA on September 16, 2002. 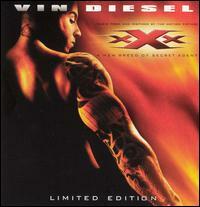 The soundtrack was also certified 2x Platinum by the CRIA (200,000 copies) in April 2003. The Canadian release featured an additional track, "Juicy" by I Mother Earth, which was added too late to be included on the American release. The Australia/New Zealand release featured the track "Me vs. Me" by 4Lyn as the 11th track, and consequently omitted "Connected for Life" from the Xander Side. • “Adrenaline” was used as the official theme song for WWE's 2002 Unforgiven pay-per-view event.